[ACT](VC)[1/Turn]:COST [Put a card from your hand into your soul], this unit can attack even on your first turn, and gets drive-1. 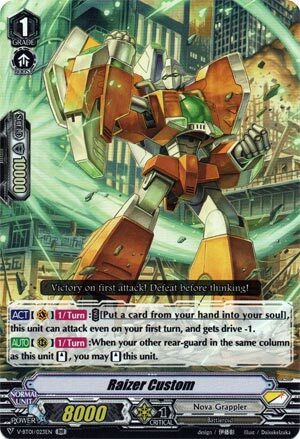 [AUTO](RC)[1/Turn]:When your other rear-guard in the same column as this unit [Stand], you may [Stand] this unit. So here we have a unit who only really gets anything done if you go first, going -1 to inflict 1 damage or take a 5k shield out of the opponent. Is it worth it? Math says barely. You’re either going to +0 wash out of this or you’re going to get 1 free damage, which is only slightly worth more than one card. But the real danger is the plays that it opens for the opponent if you’re not careful. Suddenly Royals can get Allen or Marron off turn 1, although that’s probably the only deck in Standard at the moment that can take advantage of that. So really it’s the second skill you want, combining with Burstraizer so you have an entire column in Stand ready to attack with. That alone makes this worth running frankly. 10k guard needed assuming no triggers, and at least that’ll make it strong enough to attack any Force RG if a damage trigger happens. 4-of staple, but don’t go crazy trying to inflict early damage unless you desperately need the soul and have a dead hand.